Have you ever wondered what's really in those Scrolls? Yes, the Bible but what else? Yesterday someone asked me this on Quora. True, it's not "Christ and him crucified" but the Dead Sea Scrolls are still cool. They give us an idea of what was going on in the background while Jesus and his students trod the dusty pathways of Judea. Q: What are the other books that were found among the Dead Sea Scrolls besides the books of the Old Testament? A: Of the 944 scrolls found at Qumran, 211 are “biblical” and 733 are “nonbiblical.” This latter group contains all sorts of writings. For example books from the Pseudepigrapha were found such as Jubilees and 1 Enoch along with apocalyptic books related to Enoch, such as The Book of Giants (1Q23) and Melchizedek (11Q13). (FYI, the notations with a Q in them tell you what cave they were found in and the manuscript number. This is how scholars denominate the different scrolls and fragments. “Etc.” after a notation just means there are too many copies to list them all). There are numerous songs and liturgies thanking God for his deliverances, while other psalms claiming to be authored by David and Solomon are for exorcising demons causing various ailments, such as a "fever demon" or a "chest-pain demon." The Psalms Scroll contains not just the biblical psalms but a number of others, some of which were already known from different sources while others were entirely new to us. The community that produced the scrolls (we’re not as sure it was the Essenes nowadays) penned several scriptural commentaries using a particular type of interpretation called "pesher" so as to find themselves featured in the Hebrew scriptures. The Commentary on Habakkuk (1QpHab) is an example of this. They also wrote directly about themselves, producing procedures and regulations such as the Rule of the Community, The Halakhic Letter, and the Damascus Document. There are many copies of these, and Damascus Document was originallly found in the 19th century all the way up in Syria, long before additional copies were discovered among the scrolls. They produced their own apocalyptic prophecies, the most famous of which is The War Scroll which details the final battle between "the Sons of Light" and "the Sons of darkness." Wisdom literature has been found, including Wiles of the Wicked Woman (4Q184), Mysteries (1Q27, etc), and Instruction (1Q26, etc.). A copy of Sirach (aka Ecclesiasticus), which has long been known through the apocrypha, was there. A set of beatitudes, rather different from Jesus', was discovered there too (4Q525). This really just scrapes the surface but should give you an idea of what was found besides the biblical texts. 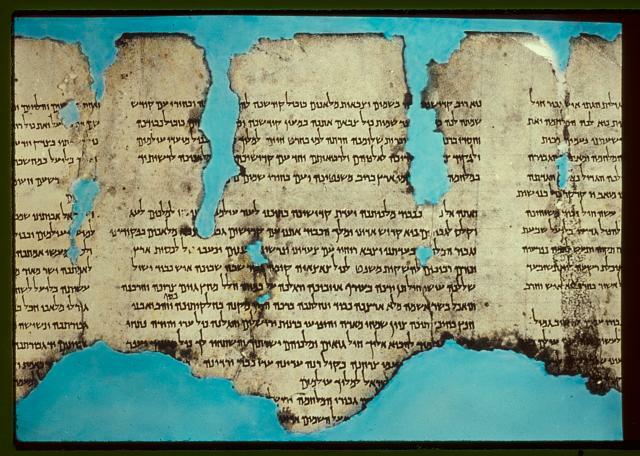 The Dead Sea Scrolls Digital Library has all the scrolls and intends to provide complete transcriptions and translations in the future. Two excellent translations of the nonbiblical scrolls are The Dead Sea Scrolls Translated by Florentino Garcia Martinez, and The Dead Sea Scrolls: A New Translation by M. Wise, M. Abegg, and E. Cook.